Foliar feeding is a technique of feeding plants by applying liquid fertilizer directly to their leaves. It has been known for many years that plants are able to absorb essential elements this way. The absorption takes place through the stomata (pores under the leaves) and also through the epidermis (surface of the leaves). Plants are also able to absorb nutrients through their bark. Direct Nutrient Intake – Foliar fertilizers are applied to foliage to boost nutrient density in crops and to correct nutrients deficiencies. The main benefits of foliar spraying is that it can have up to 90% efficiency rate of uptake as opposed to a 10% efficiency from the soil applications. This is because foliar fertilizers become immediately available in the plant because they are 100% water soluble, which makes them perfect for correcting nutrient deficiencies. Traditional granular fertilizers may take several days to take effect and nutrients may be locked by other elements in the soil and made unavailable to the plant. Increased Nutrient Uptake – Another benefit is that foliar spraying stimulates the plants to create exudates in the roots which excite microbes to work harder, and thus increases nutrient uptake from the soil. Foliar sprays are a great supplement to boost flavors, sweetness, mineral density and yield from your crops. 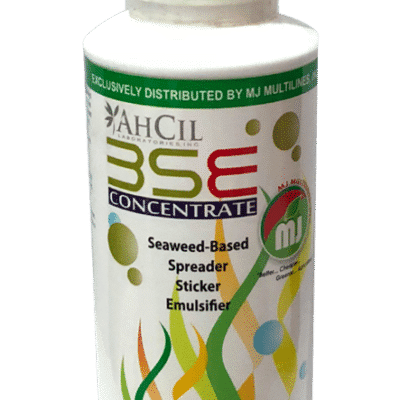 Increased Chlorophyll Activity – When applying your liquid fertilizer directly to the leaves, the very fine particles smother the surface of the leaves and the plant takes the nutrients up and trans-locates them throughout the root system, where they are stored until the plant needs them. This is in turn produces a larger root system, which grows more leaf and further increases the storage system. Another benefit of foliar feeding is the increase in chlorophyll activity and thus photosynthesis, which in turn increases the plants need for water uptake, and further promotes the plants root system. With a deeper and more dense root system, the plants demonstrate greater resilience in time of stress, such as drought or frost. Q. 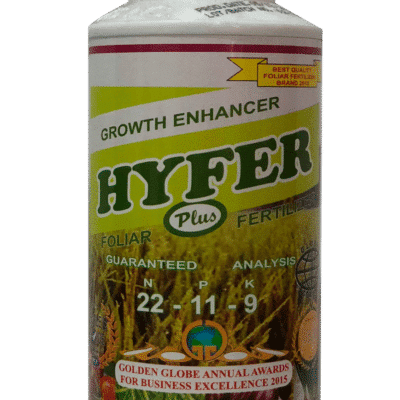 Does Hyfer Plus substitute conventional fertilizer? A. Hyfer Plus complements the use of Conventional fertilizers (ex. Urea). In cases, where Hyfer Plus is used alone like leafy vegetables, a higher return on investment is expected. Q. How effective are foliar fertilizers? A. Plants also absorb nutrients through the leaves. Foliar fertilizers applied correctly can be absorbed faster and more efficiently than conventional granular fertilizers. Hyfer Plus foliar fertilizers also contain a sticker formula, which helps the nutrients ‘to stick’ unto the leaves of the plants even after heavy rain. Q. Is Hyfer a GMO product. A. Majority of Hyfer Plus’ raw materials are organic in nature. There is no GMO component to be found. It also contains Humic Acid which also helps preserve and improve the soil. Q. 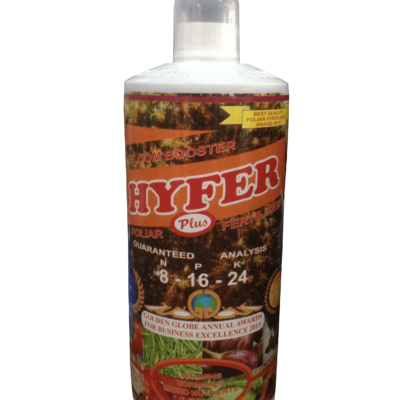 How can we use Hyfer Plus in drip irrigation? A. Just dilute 5-6 ml. of Hyfer Plus in every liter of water . Be sure to shake the bottle well before pouring out the contents. Use the existing dripper system and drip the mixed solution for two (2) minutes in the morning and two (2) minutes in the afternoon. 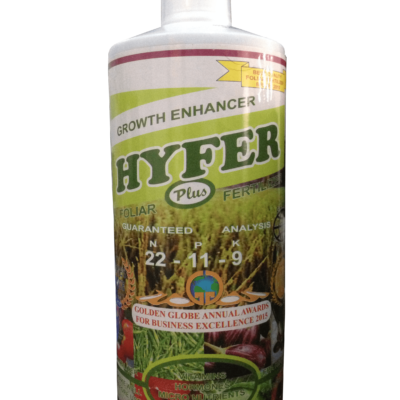 Q. I have notice in the application instructions of Hyfer Plus in the field, the days or interval for applying Hyfer Plus Green is the same as Hyfer Plus Red, so when do you apply both fertilizers at the same time? A. 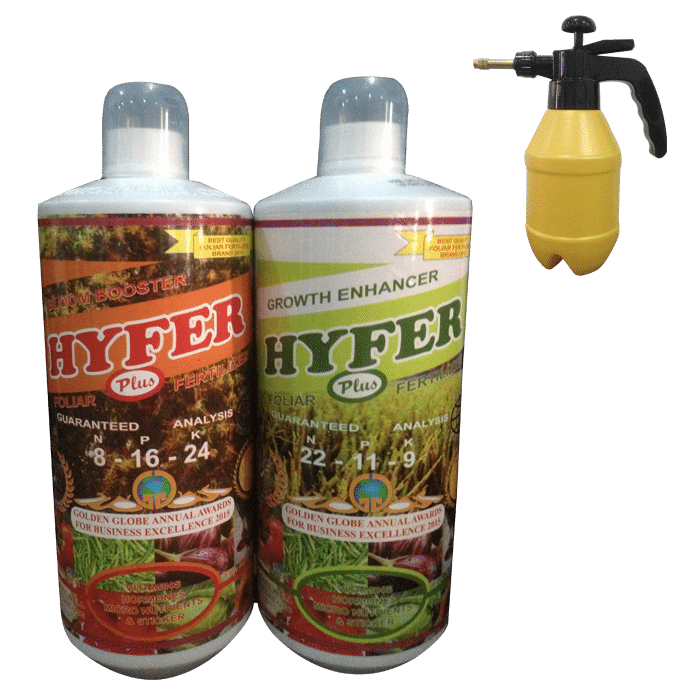 The dosage, spray interval and application frequency is the same for both Hyfer Plus Green and Red, but this does not mean that we will use both of them at the same time. The program indicated in the label is just a guide. Application depends on the plant’s requirement. For example, when you are growing leafy vegetables such as lettuce, we recommend Hyfer Plus Green, but if you observe Potassium deficiency, you should shift to Hyfer Plus Red because of its higher potassium content. We still recommend the same dosage and spray interval for both. Same is true with flowering plants (but the other way around), roses and carnation, for example, require higher Potassium and Manganese. During flowering, our flower farmers use Hyfer Plus Red more frequently than Hyfer Plus Green, but if they notice Nitrogen deficiency, then we recommend to shift to Hyfer Plus Green.